I experience anxiety. Sometimes it can feel uncomfortable, overwhelming, like I cannot breathe. My past was one of discomfort, overwhelm and breathlessness, regardless of the stressor or demand of the situation. It is the relentless feeling of discomfort, overwhelm and breathlessness that I believe describes generalised anxiety disorder. My experience of GAD included fretful, repetitive chatter, hand tremors, frequent pacing and disconnection from family and friends. For me, disconnecting looked like excess work, addiction, frequent cleaning and fanatical exercise. I would find myself experiencing pain across my lower back, neck and shoulders. Sometimes I would experience a haze of constant fatigue. Anxiety was something I wanted to escape, to be free of. I often felt an incessant fear, which I perceived could not be managed or controlled. I felt alone, helpless, and apprehensive about every aspect of my life, whether that be – money, work, relationship or the cleanliness of my home (still working on that! I am still working on every item, if honest!). I had become someone who was physically present, yet mindfully absent. I do not believe that there is any greater intervention for GAD except for hard work – counsel, support groups, psychology, self-reflection, breath work, kindness, and personal growth. One or a combination of these interventions may be necessary. Sometimes people may require additional support, whether that is medication or supplementation. Recently, I have been spending time studying the herbal and nutrition interventions that may serve someone diagnosed with GAD. The reason I am doing this is because I want to make it easier for people to see if an intervention will serve them, rather than have people trial interventions that are not specific to their diagnosis. Click on Table to view. 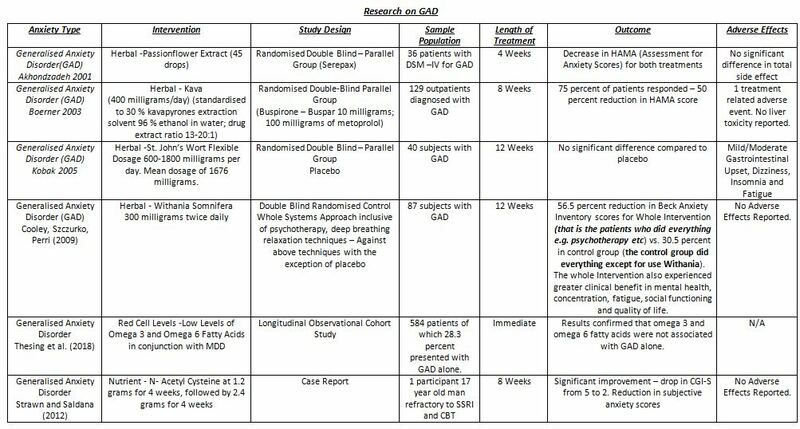 The table has been used to specify studies which are particular to patients diagnosed with GAD, not including other types of anxiety e.g. social anxiety, social phobias, obsessive compulsive disorder (I will write on these another time). I also wanted to highlight the most prominent of studies on GAD, and to show patients whether an intervention is likely to offer them any benefit. It is also important for me to list interventions specific to GAD, and not to disorders associated with GAD i.e. depression, social phobias, obsessive compulsive disorder. As you can see, the sample populations are relatively small in all of the studies (Column 4). This does not necessarily mean that this will not support you. It simply means that we do not have a wide and varied population to compare to. You can also see that of all the herbals (Column 2), the herb Withania appears to have the most potent of effects i.e. reduction in anxiety scores and overall health. Even better, there were no adverse effects reported! For me, I found the greatest benefit in using N-Acetyl Cysteine – however, the research on this is more specific to other types of anxiety e.g. social anxiety, obsessive compulsive disorder, and post-traumatic stress disorder. I am also finding in my practice that a number of people diagnosed with anxiety present with low levels of omega 3 fatty acids and high levels of omega 6 fatty acids in their blood work. You can see in the 5th row that low levels of omega 3 fatty acids may be common for people diagnosed with GAD, however, it is more likely to occur in patients presenting with depression. 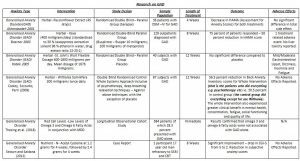 There are more studies covering these topics, however, I wanted to put forward the studies that showed some benefit, if any. If you would like to discuss these studies or even look at what may best support a diagnosis for generalised anxiety disorder feel free to make contact (see details below). Anxiety, Depression and Addiction are topics I thoroughly enjoy discussing. I am passionate about helping people work towards overcoming their anxiety, depression and addictions.